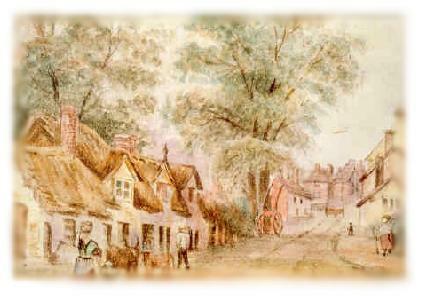 This is a Knutsford page with a map and more than 70 old and new prints added to the text of "A Cranford Walk Around Knutsford" which has been revised by Hon. Sec. of "The Gaskell Society", Mrs. Joan Leach (a walking dictionary / cycling cyclopedia of Knutsford and Gaskell), Far Yew Tree House, Over Tabley, Knutsford, Cheshire, WA16, 0HN (Telephone) 01565 634668. All rights reserved. Any print related to old Knutsford may not be reproduced, in any form or by any means, without the prior permission of Mrs. Leach. As for prints of new Knutsford please feel free to download them. Last updated: 22 January 2017.
from an unsigned nineteenth century watercolour, possibly by Lucy Holland, in the possession of J. G. Sharps. Published by the Gaskell Society, Hon. Sec. 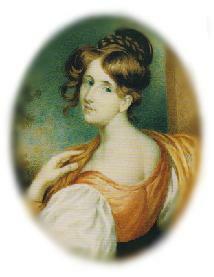 Mrs Joan Leach. Click any number in the map.